Ladies and gentleman, yours truly the Half-Eaten Mind has come into another great blogging award this Easter/April. On the 31st March 2015, keen young photographer and college student, Alex Smithson, who runs the Mother Nature blog out from nearby Croydon, has kindly nominated us for the Liebster Award. Alex was himself nominated by Chey from the blog Socially Awkward Chey, and it is his second blog award nomination for 2015. The first one was awarded by little old me 😀 !!!. 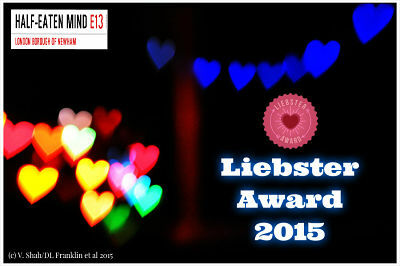 Like other awards in the blogging community, the Liebster, whose name is derived from the German word ‘liebe‘ (love) is an award designed to promote connections and love between bloggers and strengthen our special community. As part of Alex’s nomination, he has fielded ten questions to all nominees, which I’m now going to answer, once I can find my thinking cap which seems to have found itself lodged behind one of those god-awful ugly black leather sofas downstairs. Without further ado, here are the questions…. 1. What made you want to take up this hobby? I took up news-writing as a hobby for this blog, as I am a big fan of news, views and current affairs. From my childhood days when I used to sit with the parents in the living room and watch Moira Stewart and John Sissons (I think his name was) presenting the Six O’Clock News, I had a fascination with the world around me. Add to that a well enhanced vocabulary and a degree in journalism, and I knew my ideal destiny was in the media. It is because of this dream I set up this blog, so I could practice being a reporter and use this as a step-up into that highly competitive career path. 2. Who inspired you to set up your blog/website and why? The original idea for a blog came from a university classmate named Kshitij, but who was usually called Mike. We kept in contact after I graduated, and while discussing our future plans, he suggested I set up a blog to showcase my talents. This was way back in 2007, and due to certain difficulties back then, I couldn’t get the blog ball rolling. It wasn’t until 2012, when I was in a relationship with a girl in India whom I was planning to marry, that I started the blog formally. I was very happy to be in a relationship at last, and was buoyed up by my new confidence. I told her I wanted to start a blog while talking with her on Skype. In fact the name of the blog comes from an expression she used to use every time we talked, and that was that she was disturbing me by “eating my mind”. Sadly the blog outlived the relationship, but blogging is still my passion. 3. What do you love the most about life? I love my family because they bring so much happiness, I love God, I love seeing beautiful things (and people), and discovering new experiences. I cherish the diversity and opportunities that life can bring and that there are many good and decent people in this world that help negate the more dark and painful experiences that everyone has to go through. I adore my friends and supporters, both inside and outside the blogging world. 4. If there is one thing you could do in life, what would it be? I suppose now in this point in time, it would be to get married, settle down and have a family. That is my number one priority now in life. 5. What is your blog/website about? My blog is an news site covering news stories and features for London, the U.K. and the world. Think of it being like an online newspaper but with less political bias and no pressure from advertisers *laughs*. I also write personal articles, often relating to stuff concerning the blog but not always. I also feature contributions from readers and clients and sometimes use the blog to show off my photography and graphic design skills. 6. Are you the kind of person who loves to go for opportunities whilst they’re still available? There is this one saying that I sometimes quote. It goes: “when opportunity knocks, open the damn door!“. Sometimes you have to seize the moment, because it may never come round again. So, yes, generally I will take the opportunity if the time and situation is right. You never know what could happen, and if it doesn’t work out then that’s a learning experience for you. 7. If there was something you wanted to do other than what you currently do now, what would it be? I would love to travel the world. Career-wise, it would be to work as a journalist. I’m currently doing a data entry/admin job. 8. What is your most favourite quote of all time? “Rise above it all” – I can’t remember who created the quote, but it’s sort of a good metaphor for my life. 9. Do you like writing or reading books? I like both, although reading books expends less effort and you’re less at risk of succumbing to that dreaded ‘writer’s cramp’. I haven’t read a book in a while though. Writing is definitely a passion of mine too. 10. Did you like being nominated for the Liebster Award? If so, has it made your blog/website become stronger? I thought it was a nice gesture from Alex. Although I have received the exact badge before, this gives me an opportunity to work up those creative skills and create my own interpretation, which you find below. Being a Liebster nominee will hopefully gain me some new followers and put a smile on my face as my own nominees receive a nice little pingback-flavoured surprise. 1. What inspired you to first start blogging? 2. What has been your best blogging moment of 2015 so far? 3. What ambitions for your blog do you have for the rest of 2015? 4. What is the one thing that’s guaranteed to put a smile on your face? 5. What three things are you most passionate about? 6. What three things do you love most in life? 7. Which blogger has made the biggest impression on you this year? 8. If you could change one thing about the world, what would it be? 9. Do you have any blogging routines, rituals or quirks. If you do, what are they? 10. If I was a first-time visitor to your blog and you were giving me a virtual guided tour, what would be the first thing you’d show me? As befitting the nature and meaning of the Liebster Award, I’m offering you two badges to choose from, the original and also a special Half-Eaten Mind edition, created by myself. As always, you are free to accept or decline the nomination as you wish and you can accept this award at any time, no pressures or worries. Many, many thanks to my good friend Alex for considering me, especially given the intensity of his college coursework. I’m pleased and honoured that he has taken time out of a busy schedule to make this kind gesture. Also, a big congratulations to the ten Half-Eaten Mind nominees who all richly deserve this lovely Liebster. You can see Alex’s original Liebster article here. Have fun and enjoy your April and spring!! Mother Nature | The Liebster Award | The Second Award of 2015!!! Thanks for the nomination. I’ll answer your questions as quickly as possible–before anxiety overtakes me–or my common sense–whichever attacks first. You’re very welcome, Joelle…seems like a tough race, but you’ll be the winner for sure!